We’d love your help. Let us know what’s wrong with this preview of The Rise and Fall of Ancient Egypt by Toby Wilkinson. Toby Wilkinson combines grand narrative sweep with detailed knowledge of hieroglyphs and the iconography of power, to reveal ancient Egypt in all its complexity. We see the relentless propaganda, the cut-throat politics, the brutality and repression that lay behind the appearance of unchanging monarchy. To ask other readers questions about The Rise and Fall of Ancient Egypt, please sign up. 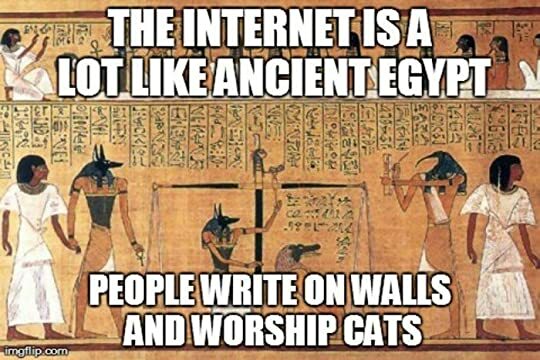 Ancient Egyptians worshipped cats before it was cool. Men wore as much make up as women, which is awesome, and something I fully support. Ramesses II had over 100 children, Hatshepsut was a badass, Akhenaten was a revolutionary and Nefertiti was fabulous. King Tut, however, will always be my favorite. I'm 100% sure that we were a married couple in our past lives. Dear Doctor Who, would you kindly lend me your TARDIS? I'll bring it back, I promise. I have to say, I really enjoyed this book. My professor may have derisively called it "popular history", but I still love this book. From first picking it up, it became hard every time I had to put it down. The combination of fluid, easy writing and the fact that this book is packed to the rafters with interesting, engaging material meant it quickly became a page-turner. Toby Wilkinson does chronicle pharaonic Egypt chronologically from pre-dynastic period to annexation into the Roman empire, a f I have to say, I really enjoyed this book. My professor may have derisively called it "popular history", but I still love this book. From first picking it up, it became hard every time I had to put it down. The combination of fluid, easy writing and the fact that this book is packed to the rafters with interesting, engaging material meant it quickly became a page-turner. Toby Wilkinson does chronicle pharaonic Egypt chronologically from pre-dynastic period to annexation into the Roman empire, a format which is apparently "simplistic", but which to me seems clear and logical, and allows the reader to comprehend later events in their proper context, building upon past precedents, and demonstrating how pharaonic Egypt shifted and evolved over its duration. This may be a popular history, but Wilkinson also writes in academia, and knows his stuff – the bibliography provides every possible authoritative work that a reader might wish for to engage in further study of the topics presented, and, as a new publication with a professional academic for an author, the book is tightly researched and up-to-date. In a bit of a glass-half-full-or-glass-half-empty situation, there were certain areas where I felt like Wilkinson provided only an overview and I wanted to know more, but on the other hand at other times Wilkinson provided me with all sorts of new information and interpretations – this is a bit of a unique situation to me though, creating the false impression of patchiness in the book, since the areas I felt were a little bit skimmed and wanted to know more about were areas of my specialist study. The Rise and Fall of Ancient Egypt is the definitive overview of pharaonic Egypt, highly recommended for beginners and amateurs, and it’s not too bad at teaching established specialists a few new things too! At the end of this week I’m leaving on a long planned trip to Egypt, one that will take me from the Great Pyramid at Giza in the north to the temple of Abu Simbel in the south, from Lower Egypt to Upper Egypt. And just to confuse you the former is the north and the latter the south! It’s the ancient Egyptian view of the world, you see, all upside down. A lot of my extramural reading for the past while has been dedicated to books with an Egyptian theme, including Lawrence Durrell’s Alexandria Qua At the end of this week I’m leaving on a long planned trip to Egypt, one that will take me from the Great Pyramid at Giza in the north to the temple of Abu Simbel in the south, from Lower Egypt to Upper Egypt. And just to confuse you the former is the north and the latter the south! It’s the ancient Egyptian view of the world, you see, all upside down. A lot of my extramural reading for the past while has been dedicated to books with an Egyptian theme, including Lawrence Durrell’s Alexandria Quartet, Olivia Manning’s Levant Trilogy (what a super and sadly neglected writer she is) and Naguib Mahfouz’s Palace Walk, the first in the Cairo Trilogy. Agatha Christie’s Death on the Nile is ready to be packed because I really want to read that sailing down the Nile. It will be yet another literary milestone for me, having read The Quite American in Saigon and Our Man in Havana in Havana! But it’s the history of ancient Egypt that I really wanted to get close to. I know ‘bleeding chunks’ already; I imagine most people know something, even if it’s only smatterings about Tutankhamen, buried treasure and mummies curses! What I needed, though, was a decent overview, one that would take me through the whole spectrum of Egyptian history, which is precisely why I alighted on The Rise and Fall of Ancient Egypt by Toby Wilkinson. This is a good book for a general audience, for people like me, coming to find a pattern in the pieces of a mosaic. The title is a little misleading, in that the Egypt of the pharaohs, beginning with the formation of the kingdom under Narmer in 2950BC, rose and fell and rose and fell and rose and fell, time and again. The wheel of history has never being better illustrated, from the Old Kingdom through the Middle Kingdom to the New Kingdom with several intermediate periods between. Add to that over thirty dynasties then one begins to appreciate the sheer scale of things, the breathtaking passage of time. For me it really is sobering to think that over a thousand years separates Narmer from Ramesses II, the Ozymandius of Shelly’s poem; that Cleopatra, the final independent ruler of Egypt (actually from a dynasty of Greek interlopers), was as far removed from the founder as modern England is from the builders of Stonehenge. At just over 500 pages Wilkinson tells his story well, in an easy and, at points, highly discursive manner. I dare say purists will find all sorts of faults but I enjoyed it. It’s the kind of book that leaves one wanting to know more, which is all to the good. The story is a complicated one. The sheer number of rulers, dynasties, ups, downs, ins, outs and transitions tends to leave one a little breathless. I found myself continually turning back to the timeline, helpfully provided at the beginning, just to put people and events into context. There are weaknesses. Given that religion played such an important part in Egyptian history a dedicated chapter on the main gods, forms of worship and patterns of belief would have been useful. It’s all there, certainly, but in quite a fragmented manner, scattered about like shards of pottery. Still, all criticism aside, The Rise and Fall of Ancient Egypt served its purpose and served it well. I now have a framework in my head which will allow me to put the traces and fragments I hope see on my travels in proper context. And that is exactly what I was looking for, a handy guidebook to one of the most beguiling phases in the history of civilization. By its nature The Rise and Fall of Ancient Egypt skips over a lot of history but as an introduction to the five-millennia-long history of Egypt - up to the Roman conquest in 31 BC - Toby Wilkinson's effort excels. If you want to know the details of a particular era, the book's near-80 pages of notes and bibliography provide a rich vein to mine. While I am familiar with the general outline of Egyptian history, every section had something new to say to me that enriched my understanding or revealed By its nature The Rise and Fall of Ancient Egypt skips over a lot of history but as an introduction to the five-millennia-long history of Egypt - up to the Roman conquest in 31 BC - Toby Wilkinson's effort excels. If you want to know the details of a particular era, the book's near-80 pages of notes and bibliography provide a rich vein to mine. While I am familiar with the general outline of Egyptian history, every section had something new to say to me that enriched my understanding or revealed some aspect I hadn't considered or known. A few of the many examples I could list include the political unification of the Nile Valley c. 3000 BC. It began with the rise of three power centers (Tjeni, Nubt and Nekhen) and ended when Tjeni's ruler (the man we know as Narmer or Menes) conquered his rivals to inaugurate the First Dynasty. From its birth, Egypt displayed many of the stereotypical images moderns associate with it, including the absolute despotism of the pharaohs. Or there's Hatshepsut, the famous female pharaoh of the 18th Dynasty. Her rule is justly famous but she was only one in a line of powerful women who played significant roles in the government. Then there is Wilkinson's focus on the Heretic Pharaoh Akhenaten's dictatorship and fanatical monotheism, rather than on the usual emphasis on his possible role in Jewish history. (And, returning to remarkable females, it's possible that Nefertiti reigned as pharaoh for several years after his death.) Another interesting period comprised the reigns of the 25th Dynasty's pharaohs, Kushites who conquered Egypt - ironically - in a religiously motivated campaign to restore the proper worship of Amun. And as a final example, it's instructive to see the Persian and Macedonian conquests through Egyptian eyes: Wedjahorresnet, an offical who collaborated with the Persian regime and convinced Cambyses to adopt pharaonic regalia, and Sematawytefnakht, who witnessed Alexander's victory over Darius. Very good one-volume overview of Ancient Egyptian history, in contrast to multivolume works, or watered-down picture books. Covers some 4970 years, from unification of Upper/Lower Egypt to fall of Cleopatra. Does good job of incorporating some new conjectures as well as recent archaeological discoveries. Does tend to focus on dynastic elements a bit much, but does cover a lot of ground and does so very well, so some things may be excused. It may well be all that we know about some eras. Author ch Very good one-volume overview of Ancient Egyptian history, in contrast to multivolume works, or watered-down picture books. Covers some 4970 years, from unification of Upper/Lower Egypt to fall of Cleopatra. Does good job of incorporating some new conjectures as well as recent archaeological discoveries. Does tend to focus on dynastic elements a bit much, but does cover a lot of ground and does so very well, so some things may be excused. It may well be all that we know about some eras. Author characterizes ancient Egypt as a 'superpower' and a 'nation-state', both of which are debatable. Despite its length, and the claims on the jacket flap, this book is definitely a popularization and not (as I had hoped it might be) a more up to date replacement for the earlier standard histories, such as the one author book by Nicolas Grimal or the collaborative Oxford history edited by Ian Shaw. The sketchy and vague coverage of the predynastic and early dynastic period was particularly disappointing, since this is the area the author is an expert on, and perhaps the one where the most excit Despite its length, and the claims on the jacket flap, this book is definitely a popularization and not (as I had hoped it might be) a more up to date replacement for the earlier standard histories, such as the one author book by Nicolas Grimal or the collaborative Oxford history edited by Ian Shaw. The sketchy and vague coverage of the predynastic and early dynastic period was particularly disappointing, since this is the area the author is an expert on, and perhaps the one where the most exciting discoveries are taking place, and where the earlier books are the most out of date; this book was not anywhere near the level of his own Early Dynastic Egypt. The Old and Middle Kingdoms are covered in about the detail one would expect from a popular book; the New Kingdom is more fully treated, the Late Period was covered in more depth than I expected, while the two brief chapters allotted to the Ptolemaic period are obviously inadequate -- he would have done better to have stopped in 332 BCE as most books on ancient Egypt do. Much of the length is due to the fact that this is a "thesis" book -- Wilkinson is concerned with hammering us over the head with his original and highly unsuspected discovery that ancient Egypt was -- gasp! -- not a modern liberal democracy! Actually, a book that showed how and why the Egyptian monarchy oppressed the peasantry or what the royal ideology was about and how it developed would be useful; Wilkinson's strangely passionate but superficial and often anachronistically expressed rhetoric is not. (For a more sophisticated discussion of the ideology of the pharaohs one could still go to the somewhat earlier The Mind of Egypt by Jan Assmann, or even to the classic nearly seventy year old Kingship and the Gods by Henri Frankfort.) What I missed totally was any serious discussion of the Egyptian economy, agricultural production, or their link with the organization of the monarchy -- there are just repeated cliches about the topography of the Nile Valley leading naturally to despotism. Even the old "hydraulic hypothesis" of the fifties was less simplistic than that. There were a lot of new perspectives and much new research in the first decade of the new millenium; there are bibligraphic references to this work in the notes, but not much has made its way into the text. The very first thing you have to know about this book is that it mimics Ancient Egypt by being mostly centered around the king and his (sometimes hers) glory. It gives readers a once-in-a-lifetime opportunity to put themselves in ancient Egyptian’s shoes and imagine how commoners must have lived with kings so distant, appearing out of nowhere and disappearing into mighty, glorious, god-like nothing, leaving a legacy of shattered dreams and unfulfilled desires to overtake gods. I presume, entitli The very first thing you have to know about this book is that it mimics Ancient Egypt by being mostly centered around the king and his (sometimes hers) glory. It gives readers a once-in-a-lifetime opportunity to put themselves in ancient Egyptian’s shoes and imagine how commoners must have lived with kings so distant, appearing out of nowhere and disappearing into mighty, glorious, god-like nothing, leaving a legacy of shattered dreams and unfulfilled desires to overtake gods. I presume, entitling the book The Rise and Fall of Ancient Egypt Kingship would have done it more justice. Anyway, speaking of books on Ancient Egypt (and the ancient Near East in general), we are rarely here for commoners, aren’t we? I wonder what kind of reader Mr Wilkinson had in mind writing his book. Was it “an experienced reader” with immense knowledge of the ancient Near East? Then Mr Wilkinson should have known better because “an experienced reader” would be unbearably bored by the end of the first chapter. For “an experienced reader” Mr Wilkinson’s book, most likely, is nothing more than seemingly endless and yet surprisingly brief chatter about power, philosophy of ancient kingship and propaganda with tiny scraps of actual history here and there. Well, maybe this book wasn’t designed for “an experienced reader”, on the contrary, its primary audience is “a devoted beginner” – someone who’s very interested in the ancient Near East and Ancient Egypt in particular and eager to absorb information. If so, then again, Mr Wilkinson should have known better because “a devoted beginner” would be unbearably bored by the end of the first chapter. For “a devoted beginner” Mr Wilkinson’s book, most likely, is nothing more than endless stream of the unknown – names, toponyms, references to mysterious conflicts and agreements, gods, kings etc. Well, maybe this book wasn’t designed for “a devoted beginner”. Maybe I exaggerate, and the primary audience of this book is someone who’s in between “a devoted beginner” and “an experienced reader”. It’s possible, but as you might have already guessed, if so, Wilkinson should have known better. Being that “someone in between” in question, I can give you a couple of reasons why I think so. I picked this book to enhance my knowledge of Ancient Egypt history. It means that I have already been familiar with its rulers, gods, art, culture and what Mr Wilkinson loves to call “propaganda”. I’d expected this book to give me some more background information, to shape and structure the information that I have so as to get a full picture, and I got none of that. It’s sad to admit that there’s no balance between entertaining musings and useful information – I call this type of books “a never-ending-preface” books. They are usually fun to read, very quotable and seemingly friendly (till you stumble upon the unknown) as prefaces are, but they leave nothing except even more questions, because “the real” part of the book, where normally you’d get the information, does not exist. Instead of giving context and background information about the ancient Near East and relations between its parts, kingship and commoners, Mr Wilkinson leaves his readers with a few useless maps and illustrations which apparently were supposed to help readers navigate in the ocean of either too detailed chapters or too brief. I have neglected Ancient Egypt in my previous perusals of the ancient world but this book has sparked a bit more interest in this civilization. This book is well written in an style which holds my interest. The author does a good job of giving a lively history of the gift of the Nile from neolithic times until the fall of Cleopatra and Anthony at Actium. Even if you aren't into Egyptian history like me this book is worth your time. A very good narrative of ancient Egyptian history. Gives a mainly political and economic overview of the period from the first king Narmer and the unification of the two lands to the fall of the last queen Cleopatra ( with a sketchy coverage of the predynastic period). The author has a good narrative style that flows through the various dynasties without getting bogged down, and their socioeconomic, religious and foreign policies and how they influenced and changed Egypt. While it doesn't go deep A very good narrative of ancient Egyptian history. Gives a mainly political and economic overview of the period from the first king Narmer and the unification of the two lands to the fall of the last queen Cleopatra ( with a sketchy coverage of the predynastic period). The author has a good narrative style that flows through the various dynasties without getting bogged down, and their socioeconomic, religious and foreign policies and how they influenced and changed Egypt. While it doesn't go deep into the study of ideology of the Egyptian kingship, it does a good job in showing how the institute of the divine kingship in Egypt has evolved and varied over the period of 3000 years, and also provides some overview of the changes in the mortuary cults and the forms of worship like the democratisation of "afterlife". There are some passages that deal with the soldiers, peasants and the craftsmen, but this book doesn't really shed much light on the daily life of the commoners. Das Buch hat mich ziemlich lange begleitet - was aber nicht heisst, dass es schlecht ist. Ich finde es sogar sehr gut. Schon seit Jahren interessiere ich mich für Ägypten und war daher sehr gespannt, was mich für Informationen erwarten. Und die Informationen sind sehr umfangreich - von der Entstehung des alten Ägyptens bis zu seinem Untergang (wie der Buchtitel schon sagt). Man wird durch die verschiedenen Dynastien geführt, was in ihnen passiert ist und wie sich Ägypten an sich entwickelt hat. Seh Das Buch hat mich ziemlich lange begleitet - was aber nicht heisst, dass es schlecht ist. Ich finde es sogar sehr gut. Sehr viele Herrscher, Könige und Pharaone werden vorgestellt - so viele, dass ich sie mir gar nicht alle merken kann. Natürlich ist darunter auch Tutanchamun, der wohl berühmteste Pharao. Ich finde die Informationen in dem Buch wirklich sehr gut, auch wenn es sehr viel auf einmal ist. Daher werde ich das Buch bestimmt noch mehrmals in die Hände nehmen und es lesen, damit ich das ganze besser verinnerlichen kann. Mir hat der Schreibstil gut gefallen, auch wenn es ab und an ein wenig trocken gewirkt hat. Das liegt, wie erwähnt, dass man sehr viele Informationen erhält. Interessant für mich war zu erfahren, wie gross die Distanz zwischen Königen und Untertanen war. Es ist erschreckend, wie gut es die Herrscher hatte und wie das Volk dafür leiden musste. Solche Dinge werden gerne 'vergessen' und in diesem Buch wird auch dieser Aspekt sachlich dargestellt. Was mir sehr gut gefällt, ist die Übersicht im Anhang von den Dynastien und den verschiedenen Herrschern - wirklich klasse und es hilft, den Überblick zu behalten. Auch die diversen Abbildungen finde ich super und geben einen Einblick in die jeweilige Zeit. Interesting and somewhat detailed look at Ancient Egypt. I knew more about Egypt of the Ptolemies so I learned quite a bit about the Old and Middle Kingdoms. I realize this is more a 'popular' history, but that's what I was looking for. I read this in a library copy. I was rather surprised to see it there. Frankly books about ancient history written for the general reader have been out of favor for a couple of decades, except for American history. 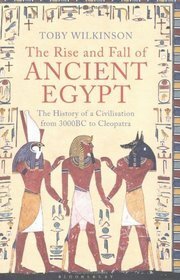 This is a full scale history of Ancient Egypt, starting very early in pre-history and going to the death of Cleopatra. I'm not sure when the last book of this type was written, but I think it might have been before World War I (and that is WW I and not WW II). A lot has changed in what I read this in a library copy. I was rather surprised to see it there. Frankly books about ancient history written for the general reader have been out of favor for a couple of decades, except for American history. This is a full scale history of Ancient Egypt, starting very early in pre-history and going to the death of Cleopatra. I'm not sure when the last book of this type was written, but I think it might have been before World War I (and that is WW I and not WW II). 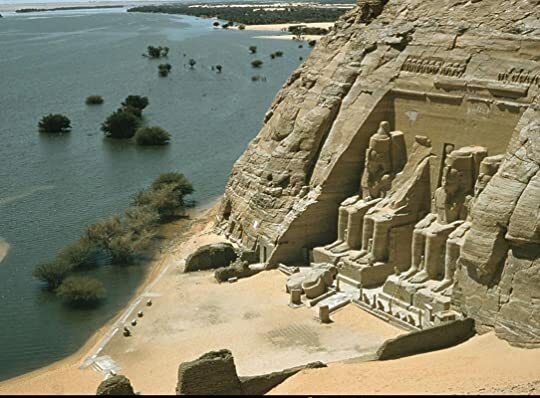 A lot has changed in what we know about Ancient Egypt, and the ancient world in general in the last century. For the most part, Wilkinson talks about the usual political history stuff. But he also puts in some paragraphs about what life must have been like for the average person in a world where they have no control over any part of their lives. For example, he points out that wall paintings at Armarna show a lot of police action going on. And those policemen have batons. And they probably USED them. There are some people who see any mention of this kind of thing as being negative. I think it is just a reaction to the histories written 50 to 100 years ago where nothing negative was mentioned at all. Egypt was a dictatorship and not a utopia. And I didn't find his occasionally writing about that negative. I will admit I speed-read a lot of this, looking for key words and stopping and reading in detail every now and then. It was just too much book, and the style did not gel with me very well. Still, a fascinating topic, and I have much to think on, re: my fascination with Ancient Egyptian culture. Full review later, probably not for a couple of weeks tbh. An enjoyable and through romp through the entire history of ancient Egypt, and I could not help but pause at several points along the way to think about the strong continuity shown in this history between ancient and modern events. The author himself marvels at it from time to time, using the famous French phrase "Plus ça change, plus c'est la même chose" (The more things change the more they stay the same) to describe his own feelings. Given current events in Egypt, I found much in this long bu An enjoyable and through romp through the entire history of ancient Egypt, and I could not help but pause at several points along the way to think about the strong continuity shown in this history between ancient and modern events. The author himself marvels at it from time to time, using the famous French phrase "Plus ça change, plus c'est la même chose" (The more things change the more they stay the same) to describe his own feelings. Given current events in Egypt, I found much in this long but well-written history particularly fascinating, and I wonder if, in the future, another historian will call the modern Egyptian efforts to throw off their recent forms of governance another "Intermediate Period" in the long, deep, and fertile history of that civilization. After reading this book, I am truly impressed by just how Arab the country has become since its long ago pharaonic days. I wonder if this Arab overlay over their native culture is truly unshakable, or if, like the Christian overlay they once had, they will find themselves shaking it off in their next dynasty, and reverting to something more in line with their own place in the modern world and perhaps, with their own underlying ancient and robust culture. If history is any guide, then the next stable government to arise and restore order in Egypt will be headed by another strong dictator who will arise from their military but have the backing of their religious leaders, and will further be backed either openly or secretly by a powerful foreign country or coalition whose gain will be to exploit Egypt for their own benefit and to the continued impoverishment and enslavement of most ordinary Egyptians. The Egyptians will regain a law-and-order society, but at what cost? Like a lot of people, ancient Egypt has always had a fascination for me, and being a history buff, I've picked up a decent amount of knowledge on the subject over the years. But, I've never had any one great source for what is quite a lot of history, and Toby Wilkinson's book serves the purpose very well. One advantage of it is that instead of just being Dynastic Egypt, the text runs all the way from what we know of pre-sedentary societies in the area (all-new to me), to the death of Cleopatra, a Like a lot of people, ancient Egypt has always had a fascination for me, and being a history buff, I've picked up a decent amount of knowledge on the subject over the years. But, I've never had any one great source for what is quite a lot of history, and Toby Wilkinson's book serves the purpose very well. One advantage of it is that instead of just being Dynastic Egypt, the text runs all the way from what we know of pre-sedentary societies in the area (all-new to me), to the death of Cleopatra, and the end of Egypt as any sort of independent entity until modern times. Coverage naturally varies depending on how much is known, with the usual suspects of the early I Dynasty and the XVIII Dynasty getting a lot of attention. Normally, I don't see much about the period between the XIX Dynasty and the Ptolemaic period, so the expanded scope was appreciated. The book is clear, concise, and well-written, and as an introductory overview stays well away from any sort of controversies, or discussion of trends of thought in Egyptology, even when those bear directly on text. The greatest example of this was having to look up Ptolemy VII separately to find out that he may not have reigned/existed at all, and if he did it was a very short while (say a month); but the book talks about Ptolemy VI and Ptolemy VIII in the same paragraph, and doesn't think to note the reason why there's a missing number. There is a stated attempt to point out forms of repression and absolutism inherent in the governmental system, but it's not all that well explored, and (since its what we have records of) the book tends to gloss over parts of that anyway in its narration of the doings of high officials and armies. In addition to the standard bibliography, there's a fairly extensive collection of color photographs (a number of black-and-white ones are scattered throughout) at the end of the (Kindle) book. They aren't bad on a smaller screen, and are big enough to view comfortably on my desktop monitor. There's also a lot of notes for further reading on specific subjects; unfortunately, at least in the Kindle version the names of books are not italicized, making them harder to pick out of the text, and the sources of articles mentioned are not given. What actually makes me unhappy, is that the reading is almost all for particular subjects, instead of anything that just breaks down to the next level of overview, i.e., suggestions for the Old Kingdom as a whole. A little over two weeks, and I’ve covered a little under 3000 years of history. Seems like a fair trade to me. I enjoyed Wilkinson’s history of Egypt. I think my rating more has to do with a list of minor cons that added up for me, but overall it should be understood that the book is well written and worth most people’s time. Covering 3000 years of history in a single volume would be a difficult balancing act, and Wilkinson plays quite the acrobat here. In terms of “here is what happened at a gi A little over two weeks, and I’ve covered a little under 3000 years of history. Seems like a fair trade to me. I enjoyed Wilkinson’s history of Egypt. I think my rating more has to do with a list of minor cons that added up for me, but overall it should be understood that the book is well written and worth most people’s time. Covering 3000 years of history in a single volume would be a difficult balancing act, and Wilkinson plays quite the acrobat here. In terms of “here is what happened at a given point in time and how past forces impacted it,” this is a solidly written history. But if you’re looking for anything beyond that, you’re going to need to look somewhere else. I wasn’t, so I was pleased, but I’d be lying if I said his book doesn’t feel a bit reductive. It needed to be because of its subject, but still that’s something to consider. It can be a pro and a con that this reads like a well written textbook. Personally, I needed this sort of historical context in order to study archaeological sites and social trends in Egypt, but this book offers none of what I see as the most interesting parts of history. The content is the same as you’d find in a very basic textbook, just written better. I liked this, but I think most would cringe at that. The aim the introduction set out did not fit the tone of the book. He presents Egypt as a very bleak place to live in the introduction, and I was really interested in that idea, although I didn’t see it played out in the book very well. This is because the focus is almost entirely on kings and their deeds-described as “glory days” very often- and when the common people do make an appearance they feel a bit caricature-y. I’m sure there’s some sort of interesting debates and scholarship about the Egyptian peasantry, and it’s not a complete agreement of “life meant nothing,” in the scholarly world. Wilkinson doesn’t point out his contemporaries’ views too often and that’s a problem. I also found the weird inputs of French a little off; that’s just me, I wasn’t expecting that. Maybe that’s because I’m used to seeing Latin all over the place. It just didn’t jive well with the rest of the text. Overall, if you want a very basic history of Egypt, this isn’t a bad place to start. However, don’t expect to read this and suddenly know everything, and expect to read more. Wilkinson’s extensive bibliography can help with that. Brushing up my Egyptian History - check! Egypt - here I come! This book is very comprehensive and really goes detailed into each of the dynasties, their socio-economic, foreign, religious policies that influences modern day society and societal structure & norms. It's super slow and one needs to be patient with it. I learned a great deal about ancient Egypt. I've long been fascinated and have watched countless TV programs dealing with ancient Egypt. Sadly, I've never visited this fascinating land. however old and fascinating you imagine ancient egypt was, it will turn out to be older and more fascinating. In the future, when someone uses the phrase, "monumental effort," I will think of this book. Mr. Wilkinson has not only attempted, but delivered, a summary history of the Egyptian civilization, from conception to Cleopatra. Aside from the scope of the work, coupled with actually having achieved it, the most remarkable thing about this book is that Mr. Wilkinson was able to craft such an accessible work. Even when faced with source material that was both sparse, thousands of years old and almost In the future, when someone uses the phrase, "monumental effort," I will think of this book. Even when faced with source material that was both sparse, thousands of years old and almost exclusively the output of dictatorial propaganda departments, Mr. Wilkinson created a narrative that is both engaging and enlightening for the everyday, non-academic reader. To give some perspective to the scale of the timeline involved, Thutmose IV, who reigned from 1399 BC to 1389 BC, excavated and restored the Great Sphinx of Giza, built by a previous Pharaoh, which was by then buried in shifting sands and already more than 1,000 years old. In today's world of countries that are mostly less than 300 years old, it is challenging to imagine unearthing a national monument 1,000 years old in a nation that would survive 1,000 years more. Thutmose IV is but one of 168 Pharaohs who are individually addressed in the book, along with relevant geopolitical and regional context for their times. Somehow, Mr. Wilkinson has derived, extracted and discovered anecdotes that illuminate the life and times of many of these pharaohs, from the famous, such as Tutankhamun and Cleopatra, to the obscure, such as Neferefra and Sobekemsaf II. While pedants may long for more detail and champions of a particular period, Kingdom or Pharaoh may wish for a more sympathetic endorsement, the overall tone of the book is even and mostly suitably detached, all while avoiding academic sterility. The flaw in this regard is the author's persistent hectoring of the ancient Egyptians for not being a replica of modern Sweden, along with its leading U.N. Gini index. Despite his sterling credentials, Mr. Wilkinson loses perspective and thus credible assessment of the realities of ancient societies when he repeatedly calls the ancient Egyptian theocratic dictatorships to task for not being more of a socialist paradise. It is hard to imagine how such a goal could have been either achieved or sustained in an era of almost universal illiteracy, cultural isolation and xenophobia. However, in the scope of a work of this magnitude, this is a minor quibble. It is daunting to even consider addressing, in a meaningful way, a time span of 3,000 years. Mr. Wilkinson has done so, and in a very readable and entertaining fashion. and what they acheived.A fantastic read,now what next? I think 3 millennia is simply too much for one book to cover without reading badly. I'm not giving it a star rating, because I don't feel I got far enough into it to really judge it. It's very well written with a superb narrative style and from an academic perspective its predominantly spot on. It tends to gloss over some of the debates which are still ongoing but only to maintain a cohesive narrative. An excellent book that provides a survey-level analysis of the entire breadth of ancient Egyptian history. Covering something like 3000 years, the book traces the foundations of Egyptian culture and the development of Egyptian religion and government. While the book doesn't provide an exhaustive analysis of any specific period of time, it does delve deeper into the more important episodes and leaders in Egyptian history (like Ramsesses II, Thutmose III, and Amenhotep III). Ahkenaten receives a l An excellent book that provides a survey-level analysis of the entire breadth of ancient Egyptian history. Covering something like 3000 years, the book traces the foundations of Egyptian culture and the development of Egyptian religion and government. While the book doesn't provide an exhaustive analysis of any specific period of time, it does delve deeper into the more important episodes and leaders in Egyptian history (like Ramsesses II, Thutmose III, and Amenhotep III). Ahkenaten receives a lot of focus, which helps to showcase just how drastic his reign was in terms of its break with continuity of pharonic rule, particularly the religious aspect. I snatched this book, because the closest I got to Egyptian history was a Masters-level course on the Crusades, and by that point, Egypt had already passed through at least a half-dozen regimes. This book details classical Egypt, with all of its allure, mystic, and grandeur. The author does an excellent job of book-ending the history, as well as really selling the audience on the continual importance of Egpytian history, even two millennia after the last pharaoh passed into oblivion. Stylistically, the book is structured well and 'reads' very easily. Whether intentionally or not, the author wrote the text in a format that should be accessible to anyone. Images are scattered throughout the book itself, and there's not one, not two, but three sections of colored photos that highlight much of the preceding content. Each 'Part' of the book has a map of Egypt at that time, and the beginning of the book has a detailed list of the 30+ dynasties and the countless individuals who ruled over Egypt, providing a helpful reference point for the reader to check back to, in the event that one gets confused. If you’re looking for a general one-shot summary of Ancient Egypt’s titular rise and fall - perhaps, like me, you need to fill in some gaps in your knowledge of world history - then this is your book. The book spans the three thousand years from the earliest rulers (there really was a Scorpion King) to the reign of Cleopatra, and details the empire in all of its strangeness and drama. Professional Egyptologist Toby Wilkinson isn’t a terribly distinctive writer, and you could have a dangerous dri If you’re looking for a general one-shot summary of Ancient Egypt’s titular rise and fall - perhaps, like me, you need to fill in some gaps in your knowledge of world history - then this is your book. The book spans the three thousand years from the earliest rulers (there really was a Scorpion King) to the reign of Cleopatra, and details the empire in all of its strangeness and drama. Professional Egyptologist Toby Wilkinson isn’t a terribly distinctive writer, and you could have a dangerous drinking game with each use of a stock phrase like “but there was a darker side” and “little did they expect”. But he manages to compress an astoundingly long history into one exciting and accessible book. Perhaps most staggering about this book is the recurrent shocks to my understanding of the human timeline. The audiobook is a bit over 20 hours. We don't even begin to discuss more familiar "ancient" civilizations like Greece, Macedonia, and eventually Rome, until we're more than 19 hours in. We are still, at present day, separated by less time to the birth of Jesus than the construction of the great Egyptian pyramids (e.g., ~2500 BCE ----- 0 ---- 20xx CE). It's a fabulous work discussing the man Perhaps most staggering about this book is the recurrent shocks to my understanding of the human timeline. The audiobook is a bit over 20 hours. We don't even begin to discuss more familiar "ancient" civilizations like Greece, Macedonia, and eventually Rome, until we're more than 19 hours in. We are still, at present day, separated by less time to the birth of Jesus than the construction of the great Egyptian pyramids (e.g., ~2500 BCE ----- 0 ---- 20xx CE). Dr Toby Wilkinson joined the International Strategy Office in July 2011, working with the Pro Vice Chancellor (Jennifer Barnes) to support the schools, faculties and departments in their international engagements, and to develop the University's international strategy, particularly with regard to research collaborations and relationships with the EU, US, India and China. Prior to this, Dr Wilkinso Dr Toby Wilkinson joined the International Strategy Office in July 2011, working with the Pro Vice Chancellor (Jennifer Barnes) to support the schools, faculties and departments in their international engagements, and to develop the University's international strategy, particularly with regard to research collaborations and relationships with the EU, US, India and China. Prior to this, Dr Wilkinson was the Development Director at Clare College as well as Chairman of Cambridge Colleges Development Group. As an acknowledged expert on ancient Egyptian civilisation and one of the leading Egyptologists of his generation, Toby Wilkinson has lectured around the world. He has excavated at the Egyptian sites of Buto and Memphis. He is a member of the editorial board of the Journal of Egyptian History and has broadcast on radio and television in the UK and abroad, including BBC’s Horizon and Channel 4’s Private Lives of the Pharaohs, and was the consultant for the BBC’s award-winning documentary on the building of the Great Pyramid.